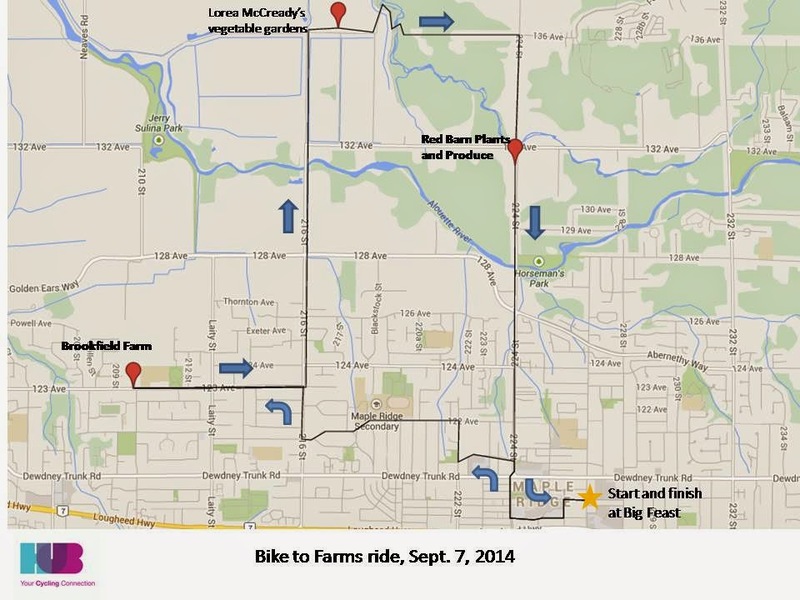 Join Golden Ears Community Co-op and our HUB committee for our second Bike to Farms ride on Sunday, Sept. 7. We'll be leaving from Big Feast restaurant (11920 227 St., Maple Ridge) at about 1:00 pm, and we should return there by about 4:30 pm. *NEW* Brookfield Farm, a historic farm owned and operated by Matthew and Deanna Laity. Lots of animals and lots of interesting stories! Lorea McCready, who lives on a lovely property overlooking the Golden Ears mountains, where she, with the help of her kids, lovingly and expertly grows, and preserves, an amazing variety of vegetables and fruits to feed her family. Red Barn Plants and Produce. This is where much of the produce is grown that owners Elke and Ken Knechtel sell through their CSA program, as well as at the farm gate and at the Haney Farmers Market. This year's ride is sponsored by the Maple Ridge Agricultural Advisory Committee. Donations to the Golden Ears Community Co-op would be much appreciated. For those of you who were wondering: out of safety concerns we decided not to visit Golden Ears Cheesecrafters this year, but we're hoping to once again include this yummy destination in future Bike to Farms rides once the planned multi-use path along 128th Ave. is completed. Participants will be required to sign a waiver at the start of the ride. Of course we will all be expected to follow the rules of the road, such as wearing a helmet, riding single file when riding on the road, and pulling over when an emergency vehicle is approaching. You can view a description and photos of last year's ride here. My husband and I participated in the Slow Food Cycle Tour in Agassiz a few weeks ago. Same idea, only much bigger! Hundreds of people participate every year. I wrote about it in my last column in the Maple Ridge News. It would be appreciated if you could register for the Bike to Farms ride in advance, so we have an idea how many people we can expect. Please send me an e-mail at jchow23708@yahoo.ca.